The Great Silk Road is rightly considered to be one of the remarkable achievements of the ancient civilizations. For the first time in the history of mankind it has connected different countries and nations from the Mediterranean to the Pacific Ocean, has combined their material, art and spiritual cultures. For many centuries on this route people were interchanging handicrafts, technologies, ideas and beliefs. The historians date back the origin of the Great Silk Road at its full extension to the second half of the 2nd century B.C., when the Chinese diplomat and spy Chjan Tzyan originally introduced to his countrymen Central Asia - then unknown region located in the West. The name "Great Silk Road" is associated with silk - then rather valuable article of trade, which introduced the East to the West. It is believed that the secret of silk manufacture was discovered almost five thousand years ago. The growth of scientific and public interest towards the Great Silk Road, its significance and its role in the development of world's civilization is not accidental, as this notion is much broader than just "a caravan road". Researchers believe that it is because of the propagation of spirituals values, scientific and technological knowledge, religious and cultural beliefs that numerous big market towns sprung along all the routes of the Great Silk Road. The Great Silk Road had a considerable impact on the formation of political, economic and cultural order of the countries located along these routes. Time and again this region underwent predatory and internal wars; powerful and small states appeared and collapsed; former capitals gave way to new ones. Today people of many countries seek after learning the roots of their history, after realizing the background of spirituality and their national belonging to the world's culture. Such an opportunity has appeared after there was reached the decision on revival of Great Silk Road as the most important channel of profound international cooperation in such areas as diplomacy, culture, science, trade and tourism. This decision was taken in 1993 at the U.N.O. General Assembly held in Indonesia. The World Community attributes great importance to this process. In 1988 UNESCO started to implement the project intended for 10 years: "Integrated research of the Great Silk Road - the route of dialogue". The project comprised the activities aimed at full-scale thorough study of the ancient route history, establishment and development of close cultural contacts between the East and the West, cementing of the relationship between the nations of Euro-Asian continent. The implementation of the project appeared to be such a success that there was taken the decision to keep on with the project. At present the cumulative data form the basis for further more specific cooperation on restoration and conservation of the unique monuments of Silk Road region that are included into the UNESCO World's Heritage List. Many of these monuments are located in the countries of Central Asia, Azerbaijan, Armenia, Georgia and Iran. But majority of these architectural attractions can be found on the territory of modern Uzbekistan. Such monuments as Ichan-kola ensemble in Khiva, historical monuments of ancient Bukhara, Samarkand, Shakhrisabz, have acquired worldwide significance. 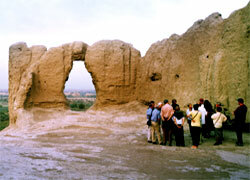 Of high distiction too is Merv - an ancient well preserved town-oasis, located on the territory of modern Turkmenistan. Many cultures and religions originate from the medieval Mesopotamia, the area between the Tigris River and the Euphratus River. 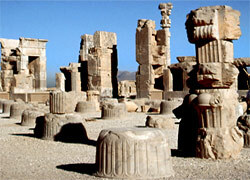 The past thousands of years left us many wonderful monuments including world-renowned Choga Zembil which is a vivid evidence of Elam princedom - the contemporary of Shumers and Babylonians, one of the capitals of Akhamenides' State - Perspolis, the masterpiece of Moslem culture Meidan Emam in Isfagan, Zoroastrian sanctuary in Takhta-Suleyman. 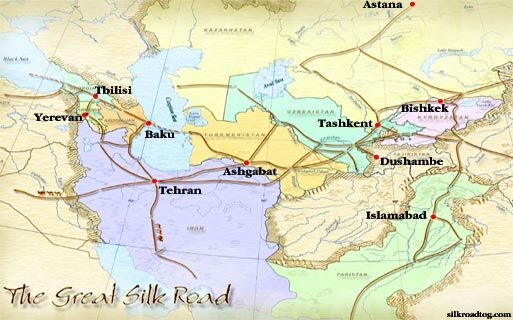 The routes of Great Silk Road also passed through the Caucasus. Thus the historians of antiquity testified the importance of ancient Armenian state. In later period it was the stronghold of Christianity in the region. Armenian and Georgian temples and monasteries impress a visitor by their grandeur. Numerous masterpieces of world's cultural heritage can also be found in Azerbaijan. One of them is the ancient walled urban site with its Shirvanshakh Palace and Maiden's Tower in Baku - the capital of the country. The Great Silk Road, however, is renowned not only for its man-made monuments, but also for ample spiritual heritage, including folklore. 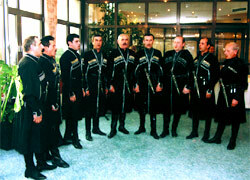 Just as famous are the Georgian polyphonic singing called "shakrullo", the cultural wealth of Boysun Region in Uzbekistan, other spiritual values illustrating the prime and development of various cultures throughout the whole length of Great Silk Road. At present UNESCO patronizes all of them. Great Silk Road today is one of the most attractive tourist routes. It is much due to the revival of Great Silk Road that the mankind have got the access to the global heritage of different nations who for thousands of years lived along this great transcontinental arterial road and who formed and matured their varied cultural wealth. A rather important mission in reviving the Great Silk Road is assigned to the World's Tourist Organisation (WTO), which today is implementing long-term tourist project aimed at promotion of tourism in this region. 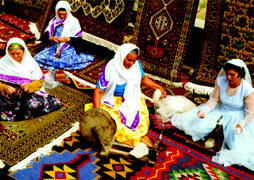 The Great Silk Road as a tourist product has many peculiarities. Unlike classical tour, which implies the touring of one separate country, it is a transnational tour, where a traveler is given an opportunity to visit several countries at a time, to introduce himself to the past and the present of these countries. We invite you to make a tour of Great Silk Road. Traveling along these ancient caravan routes that in the past connected the West and the East, you'll get ample knowledge and memorable impressions, will see at first hand the grandeur of achievements of human civilization.